Welcome to Macro Flowers Saturday #54, the last one before taking a break. I have some daffodils, lovely spring flowers, to cheer us up a bit. I don't know about you but I really need it. Not one soul came back to vote, so we are all winners this week. Some of you probably have noticed that I don't post much lately to my blogs. Beginning from last summer I was not feeling well and I've made all kind of tests to find out why. No doctor could tell me what's wrong, so in late autumn, after searching for my symptoms on the internet, I've got the idea to take the Western blot test for Lyme disease. Lyme disease is the most common tick-borne disease in the Northern Hemisphere, transmitted to humans by the bite of infected ticks. Of course, I tested positive to the Western blot test. That was when I moved the MFS meme to this blog, thinking that I could schedule the weekly posts with ease. Unfortunately it doesn't work that way. Now I'm in the third month of severe antibiotic treatment with no results but much more damage from the drugs. I decided to complement the treatment with intense workout and getting back closer to that old man from above, we always remember of when nothing else helps. I'm feeling very tired, and as much as I love flower photos and blogging, I must take a break. I'm not giving up (yet), just eliminating some unhealthy habits, like that of sitting near my computer for long hours. Though I'm paying the highest price for taking some photos in the park, I'll keep doing it and post the photos once in a while. I want to thank you all for the beautiful photos you've shared and the lovely comments. I hope to come back soon as good as new and continue what I started, so keep taking flower macros! Please don't comment on this subject, I just wanted to let you know why I suspend, temporary I hope, this meme. I'm so sorry to hear about the Lyme disease that is affecting you. My best of luck and get well soon wishes to you for a smooth and speedy recovery. Rest well and let us do the work of posting in your meme. Hope you enjoy looking at the flowers to take your mind off for some mental relaxation. 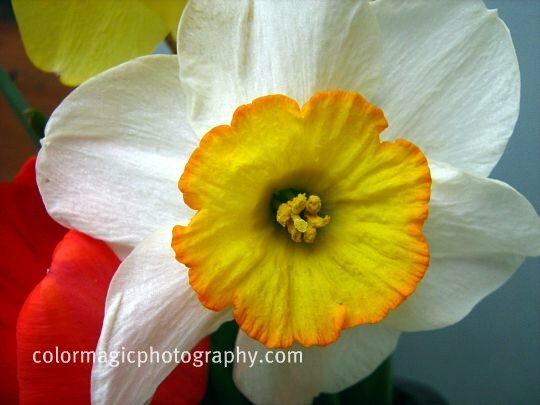 Beautiful macro of a daffodil! I'm a happy participant this week. Will be remembering you in my prayer times as you take your break. Have a restful and blessed one. I just found you and I am so sorry to hear you're sick, but God is mighty to heal! Please accept that we all hope for your complete and speedy recovery. May the flowers help heal you. And that daffodil is GORGEOUS! 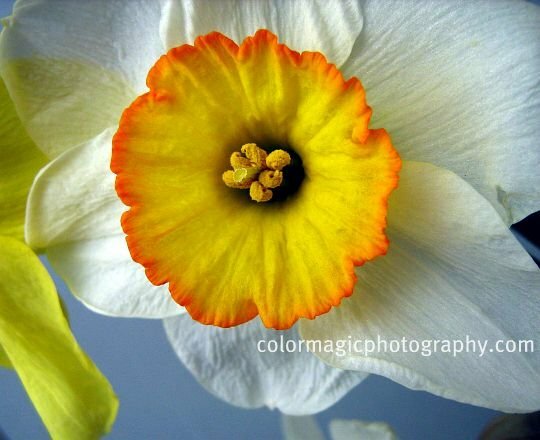 The Daffodils are gorgeous, all their intricate beauty comes out in this macro.Wish you from my heart a speedy recovery. Have a good rest and be very positive that all will be well! Love your daffodils. I´m sorry but I was not aware of the voting. On My Macro challenge I only provide the list. I don´t even visit all of the participants. The only thing I do is to create the list. And check if there are any problems. We have tics problems too and that is not fun. Take care. Your daffodils are gorgeous, I am waiting patiently for ours to bloom. Their lovely colors can brighten our days. I keep forgetting about the voting, I will try really hard to remember this week. Sorry to hear about it and I include you in my prayers. Dear Maia, get well soon. We'll miss you, so come back as soon as you can. Maia, I did not know that there are ticks in the garden that can infect us! I was only wary of bugs! People warned me about infections from my dogs and other animals I love to hug and kiss but I figured if I die from it, so be it. We really push ourselves to the limit in our passion to be in the moment. Sometimes, we do not even see the pitfalls and danger but just the quest and our need to find whatever our heart yearns for. I light a candle for you, Maia, and for all of us, embracing our pain, our sickness, and surrendering to our healing journey and blooming fate! Maia, que fotos lindas você tirou! Vou colocar seu nome no caderno de orações para que você sare e volte logo! Que Deus possa restaurar sua saúde!Abraços! Thank you all for the kind words, good wishes and prayers. It's nice to have so many good friends. Take good care of yourself Maia, hopefully you're on the road to full recovery! Love the daffodils. Maia - I am so sorry to read about your illness and the resulting struggles. Your flowers photos are colorful and beautiful. We do not have spring here yet, so I post photos from last year. I will keep you in my prayers for a speedy recovery. Como você está? Está melhorando? Seu nome está sempre em minhas orações. Abraços! Maia, hope you are fine and everything's ok. Take care! Hi Maia, After a taking a two months hiatus myself I came to share my spring photos to you and found disheartening news that you are not feeling well. I send you my best wishes and prayers.